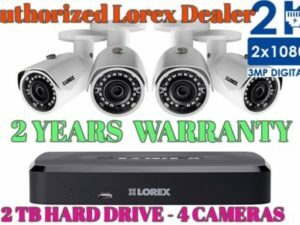 Know that your property is secure while you’re there and while you’re away with this Nocturnal security camera system from Lorex. 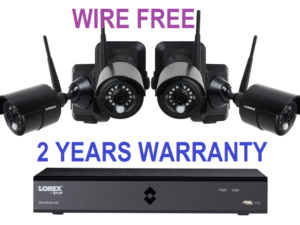 This system combines eight powerful Nocturnal security cameras and a powerful sixteen channel NR900 Series Network Video Recorder (NVR). Along with 4K recording resolution, the longest night vision ranges available, and extreme weather performance, both sets of security cameras include motorized zoom lenses that allow you to adjust the camera’s field of view to suit your monitoring needs. The dome security cameras included here also come with a built-in microphone for listen-in audio capabilities. These features, plus eight open channels on the NVR, makes this an incredibly versatile security system perfect for any type of property. 4K Nocturnal security cameras use an 8.51 MP image sensor. This sensor is capable of producing exceptionally sharp 4K video that will give you the best chance to capture distinct details, such as facial features. The difference between a 1080p security camera and a 4K security camera is quite large. A 1080p security camera, for example, records at a pixel ratio of 1920 x 1080 – a total of 2,073,600 pixels. A 4K security camera, on the other hand, records at a pixel ratio 3840 x 2160 – a total of 8,294,400 pixels. That’s an additional 6,220,800 pixels! Ultimately, this higher pixel count results in a much higher quality of video, with sharp definitive lines that distinctly outline every object and feature. It also allows for better digital zooms when you need to zoom into your footage. So specific details will remain legible for longer and give you a better chance of capturing the details you need. 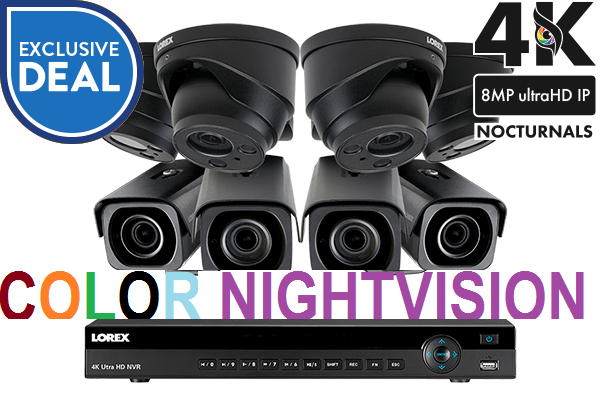 Both sets of cameras in this system offer the longest night vision range available. With the help of some ambient lighting, their night vison range can reach up to a remarkable 250ft! Adding some external lights around your cameras will also enable their Color Night Vision™ feature. This can provide you with a whole new layer of details and add further contrast. Inside of your Nocturnal security cameras is an incredibly sophisticated Sony Exmor R™ image sensor. This type of sensor is especially useful for security cameras because of its amazing low-light performance. It uses back illuminated technology to capture more light, as the incoming light bypasses the normal layer of metal wiring and transistors that can diminish the amount of light with front illuminated image sensors. This sensor also shields the video from low-light noise / grain by passing the signal through an analog noise reduction program before converting the video signal to digital and a secondary noise reduction after conversion. The infrared light emitted by security cameras can sometimes discolor daytime video. Thankfully, your Nocturnal security cameras come with an Active Mechanical Lens Filter that prevents these rays from entering the lens during the day. The filter will then automatically disengage at night, allowing the infrared light into the lens. Nocturnal cameras can record 4K resolution video at 15 FPS (frames-per-second) or 2K resolution at 30 FPS. Recording at 30 frames-per-second will provide you more realistic, real-time, on-screen movement. It will also grant you with more frames to choose from when cycling through footage. 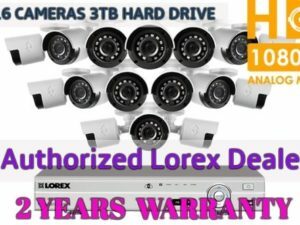 Your security cameras use an HDR (High Dynamic Range) feature that uses the difference between the brightest point and the darkest point of the video to automatically adjust the picture’s brightness. This results in optimized, highly-detailed security video in all sections of the frame. 3D-DNR (Digital Noise Reduction) technology ensures clean, accurate video with exceptional clarity and sharpness. It will also filter out digital noise caused by motion. The dome cameras included in this system are capable of recording audio thanks to their built-in microphone. Audio monitoring can provide you with more information (such as voices) and can even help provide more insight into key events, even if they occur off-screen. Your security cameras are housed in aerospace-grade aluminum. This means that they can last for years and years, even if they are directly exposed to intense weather conditions. Connect your NVR to our innovative FLIR Secure app for your mobile device. You will be able to securely view your security cameras from virtually anywhere in the world, keep track of all motion activity with easy-to-read timelines, and receive push notifications for motion-triggered events with this app. You will also be able to turn a camera on and off anytime you wish (a first for NVR security systems) using the new privacy feature. The FLIR Secure web viewing portal is also available for PC and Mac personal computers. Connect each security camera to the NVR using a single Cat5e ethernet cable. This cable provides video and audio transmission, power to the camera, and a stable network connection. It also offers installation flexibility up to 300ft, as the cameras receive power directly from the NVR using Power-over-Ethernet technology. A reliable 3TB security certified hard drive come pre-installed in your NVR. This is not your typical household hard drive. It is specifically engineered for security purposes and can continuously record footage without a break. If desired, you can install two 6TB hard drives within this NVR for a total of 12TB. The recording settings on each camera can be customized to suit your needs. Either record continuously, record only during specific hours, or record only when motion is detected. This means that you can set more important cameras to record all of the time, while others can be set to only record during specific hours or if they detect motion. If you wish to only record motion events, there is no need to worry about missing those first vital moments. The NVR includes a pre-recording function that goes back to record the five seconds before the motion was even detected.